Okay, so there will be no singing, but there will be prizes–so many prizes! 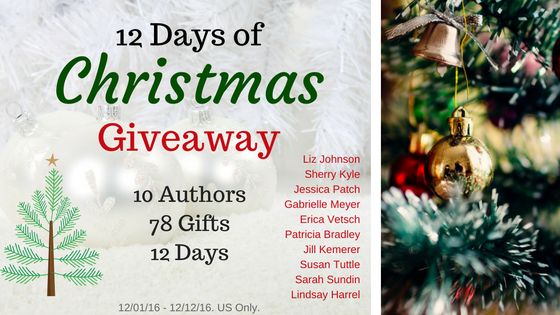 Join me and some of my favorite authors for the 12 Days of Christmas Giveaway. Here’s how it works: We’ll randomly select a winner every day for the first twelve days of December. And each day the prize builds with another book or book-related goody. 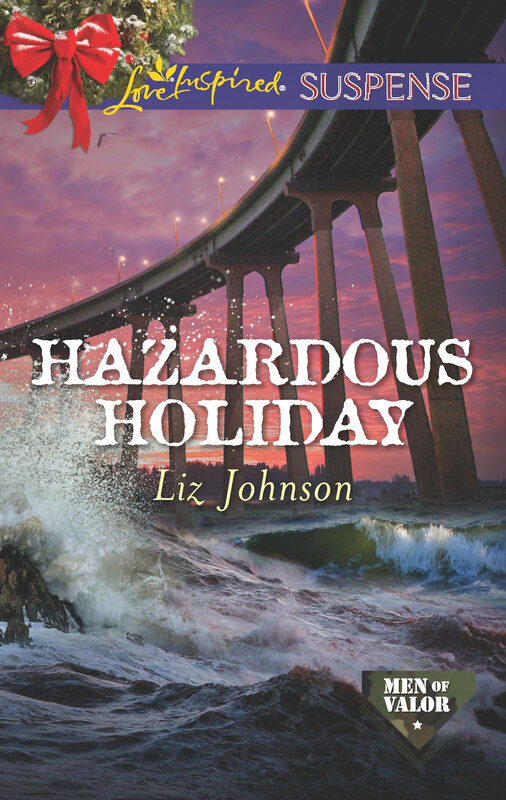 Just in time for the holidays, navy SEAL Zach McCloud returns home from deployment—and discovers someone wants his family dead. When he married his cousin’s struggling widow, he vowed to help her and her seriously ill son, and now he’ll risk everything to protect them. Even if their arrangement is only temporary. Kristi’s certain an unhappy client from the law firm where she works is determined to hunt her down. But when a sniper bullet wildly misses its target, they begin to question whether it’s really her someone wants dead. Working together, can they figure out why they’ve been attacked…and keep little Cody from the nefarious forces dead set on making this Christmas their last? Enter in the Rafflecopter giveaway below by following some of your favorite authors on social media and signing up for their newsletters. Every entry carries over for the next 11 days of the contest–so the sooner you enter, the more chances you have to win. And be sure to visit Sherry Kyle’s blog on December 2nd to learn about the Day 2 prize! Valentine’s Day is right around the corner, and to celebrate love–and the release of my upcoming book–I’m giving away a Red Door Inn Prize Pack! 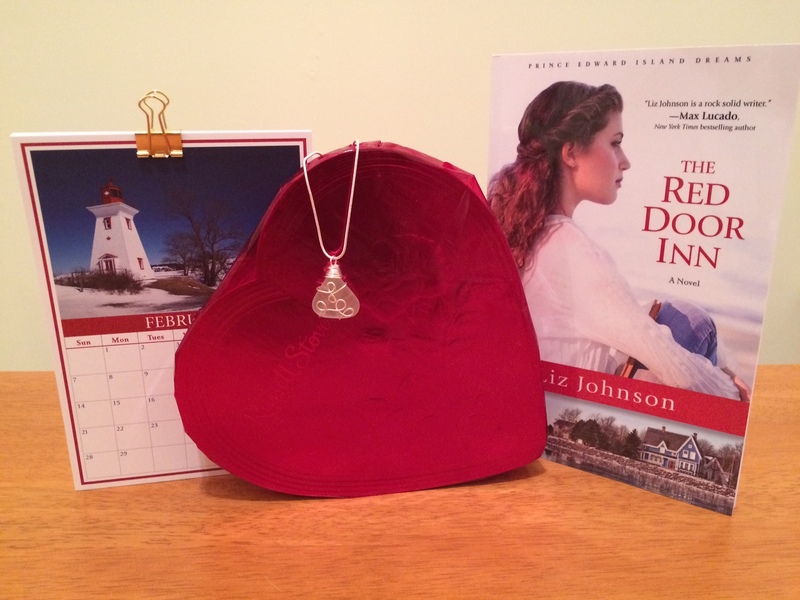 One winner will receive an authentic Prince Edward Island seaglass necklace, a custom PEI 2016 calendar, an advance reader copy of The Red Door Inn, and chocolates in a heart. What’s not to love about love and PEI? Two of my favorite things–and both happen to feature heavily in The Red Door Inn. So enter below for a chance to take home a Valentine’s Day gift for you (or someone you love). Win a Thomas Nelson Novel! As I promised earlier this week, I’m giving away a Thomas Nelson novel OF YOUR CHOICE! Actually, I’m giving you 2 chances to win. That’s it. I’ll select a random tweeter on Thursday morning, 11/10. Simple enough. Second opportunity: Leave a comment on this blog post. Yup. This one. Tell me you want in, and I’ll (again) randomly pick 1 commenter to win on Friday morning, 11/11. What could be easier? And the prize for each randomly selected winner? She gets to pick ANY (current) FICTION title from Thomas Nelson. Yup. She gets to zip over to their website, select the book that looks most interesting, and let me know which one it is. It’s that easy. It’s open to anyone (except my family and, of course, void where prohibited), but I can only ship to US or APO addresses. Thanks to the VERY kind folks over at Thomas Nelson fiction, who graciously offered me a few books and then said I could share them with you all. So which book would you pick? Leave a comment and we’ll find out on Friday. See you all then! Can you believe how fast this summer is flying by? I know, I know. It’s only June, but it feels like the heat and cicadas (yes, Nashville’s had a nice little visitation from these pests) have been here for ages. I don’t know about you, but I think it’s about time to put your feet in the pool and relax with a good book. That’s where I come in. 😉 I’m giving away an autographed copy of the perfect summer read, The Art of Romance by my friend Kaye Dacus. I remember going for a walk through some botanical gardens with Kaye as she was writing this book. She had all sorts of fun stories about writing a scene to match the cover and her wild hero Dylan. I knew right then that it was a winner! Sassy understands her friend’s reservations about timing, but she also sees so many ways in which Dylan would be the perfect match for her thirty-four-year-old granddaughter Caylor. 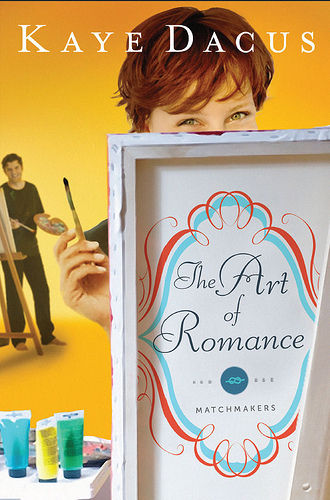 With his record of acclaimed paintings and Caylor’s bestselling novels, they could complement each other’s talents and provide each other support and encouragement. And there’s no denying the spark of attraction between the English professor with the untamed red hair and the painter with unusual tattoos. So you want to read it? I thought so! 🙂 Here’s how! Leave a comment that answers the question: What’s the most romantic thing anyone’s ever done for you? Leave your comment between now and next Monday (June 13) at noon. I’ll randomly pick one commenter and send them the book. Good luck! 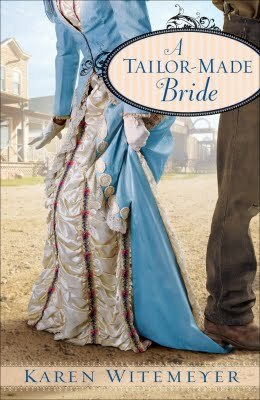 I recently read A Tailor-made Brideby Karen Witemeyer. In fact, I stayed up well past my bedtime to finish it. (And trust me, I paid for it the next day.) But it was cute, and I really enjoyed it. Jericho “J.T.” Tucker wants nothing to do with Coventry, Texas’s new dressmaker. He’s all too familiar with her kind–shallow women more devoted to fashion than true beauty. Yet, except for her well-tailored clothing, this seamstress is not at all what he expected. Hannah Richards is confounded by the man who runs the livery. The unsmiling fellow riles her with his arrogant assumptions and gruff manner while at the same time stirring her heart with unexpected acts of kindness. Which side of Jericho Tucker reflects the real man? When Hannah decides to help Jericho’s sister catch a beau–leading to uproarious consequences for the whole town–will Jericho and Hannah find a way to bridge the gap between them? Both the hero and heroine in this book are immensely likable–especially after we learn what’s turned Jericho off from frippery. 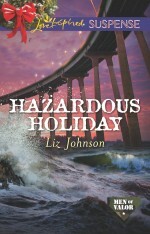 Hannah is quite prone to accidents and Jericho to saving her. They’re quite fun, and while it felt like the second half was about thirty pages too long, it was a lot of fun–classic historical romance. And lucky for you, I somehow wound up with two copies of this book, so I’m giving one away to you. Just leave me a comment on this post by Sunday at 11:59pm to be entered to win. I’ll pick a winner at random from comments made by then and send you your very own fun read!